First things first: Thanks to Adam Crofoot (MaxSuffering) for leading the first ascent of this route. I’ve been eyeing it for a while, but his expertise transformed it from dream to reality. 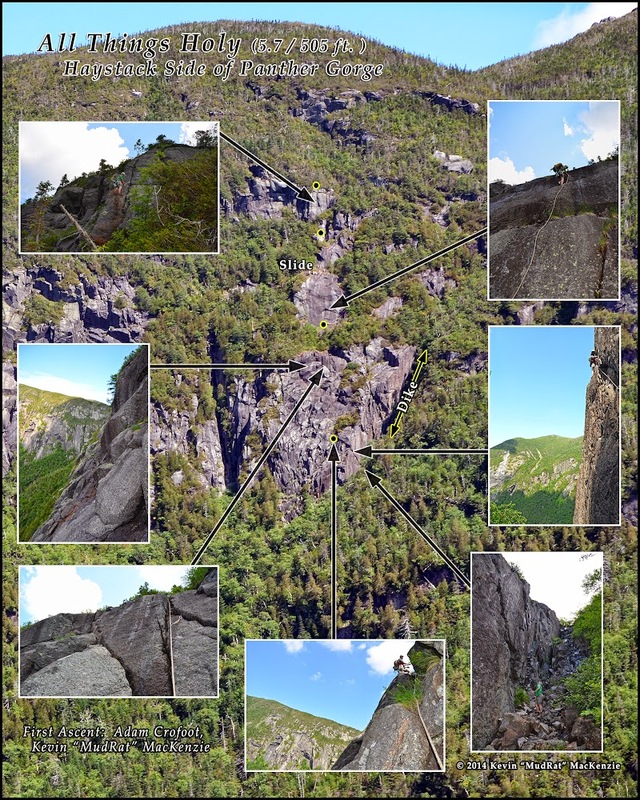 When I was last in Panther Gorge with Anthony Seidita in June, we had sights on a cliff on the western aspect below Little Haystack, what I’ve started calling the “V” Wall on account of its shape and position between a gully on the left and basaltic dike on the right. The weather skunked us so we spent a couple days exploring the gorge and targeted a couple technical slides to the south on our last day. I never forgot about the unexplored terrain. Adam emailed recently and we set up plans to head back into the gorge with all guns trained on this area. 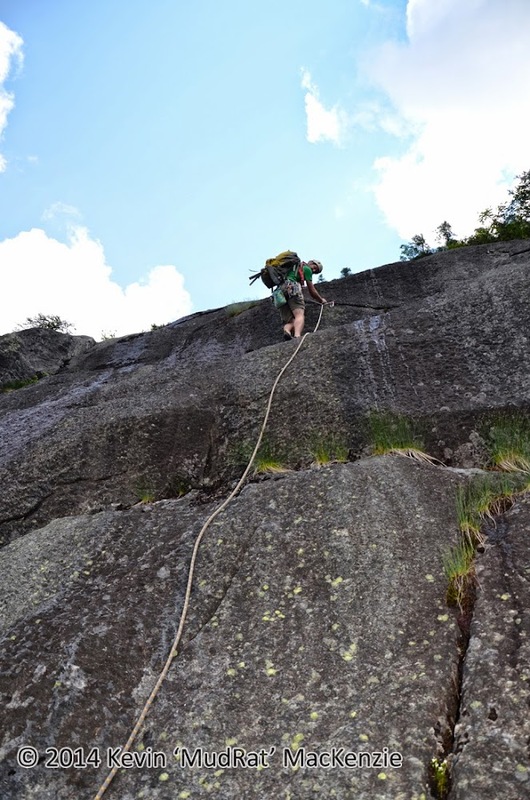 The climbing was on excellent rock and easy by technical climbing standards. Putting up the route didn’t require study of the face or cleaning, it was simply a matter of simply following the most interesting features to the top. Top--Route showing full approach. Bottom--Direct view from top right side (on the white streak) of Marcy East Face. Click HERE for FULL SIZED Image. Yellow dots are belay points. We left the Garden at 5 a.m. and set a comfortable, but steady pace to the north end of the gorge. By 8:30 we were descending along the usual route to right of the drainage and the technical walls on Mt. Marcy. As the “V” Wall came into view; I grew curious about Adam’s opinion—he was interested. Other parts of the gorge to the north had also drawn my attention in the past, but I hadn’t had the chance to get close to them. We took care of that problem as well. At 3,700 feet in elevation we crossed the drainage through the talus and climbed up to a large rather featureless wall in the northern jaws. Following a ramp above other smaller cliffs led up steep terrain to the base of larger shield of anorthosite (see red line in the photo where it meets the first cliff). From there we hugged the base of the cliff and scrambled up some steep, very steep, terrain. 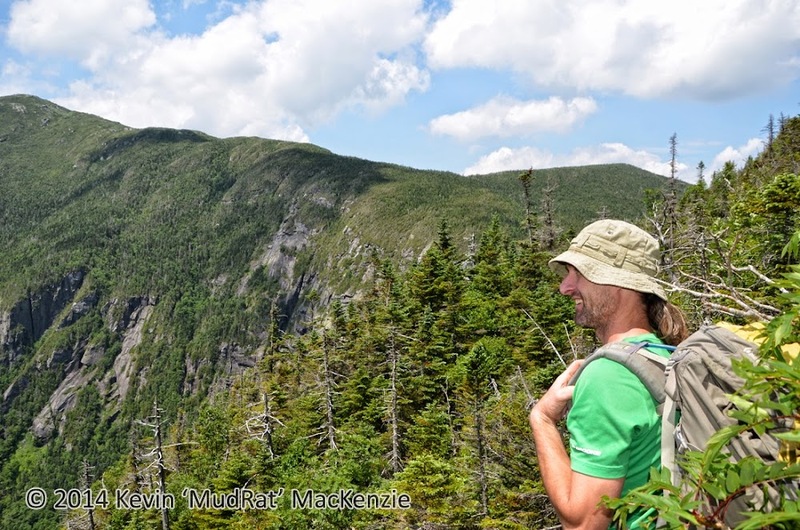 This was tough bushwhacking through cedar, some small mountain ash and a few balsams. The Haystack massif guards itself well on all sides. As the traverse leveled, the area below the cliff opened to the usually grassy corridor we find below most cliffs. Adam following below the large 'blank' wall (here). Searching for viable lines worth the energy, we worked slowly south glancing to the rear and eyeing the routes on the Marcy side—simply awe inspiring. The stone above was less than vertical in many areas despite its appearance from afar. As expected it was broken with ample cracks and other features. A few lines looked interesting, but rather short compared to our quarry. 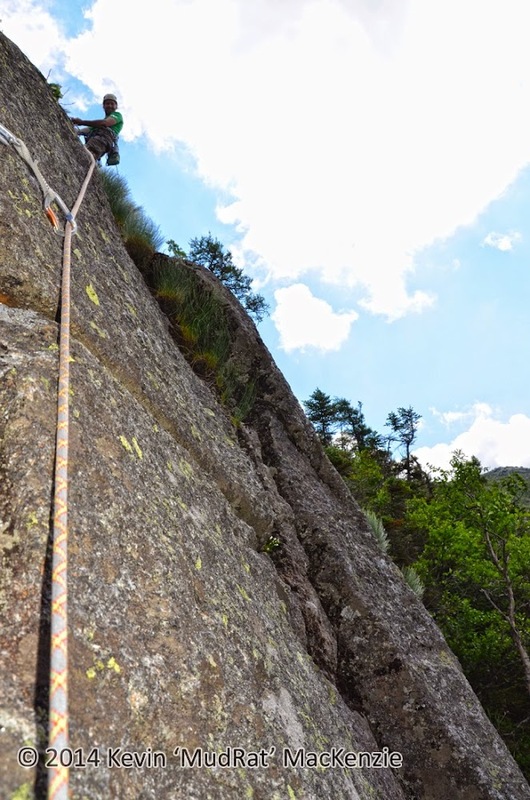 I suspected the possible route on the wall to the south was around 500 feet long covering 400 vertical feet...I just didn’t know if the quality was worth the effort. Continuing along, I realized just how much there is to explore. Take climbing out of the equation and it’s a photographers dreamscape; balanced blocks and slices of the cliff perched at odd angles—steep gullys—unique geometry and beautiful views. As we approached the a dominant gully forming the left-hand border of the “V” Wall, we found ourselves on increasingly vertical yet treed terrain. Dropping down a smaller gully, we quickly lost about 100 feet of elevation and contoured over to the base of our target. The wall tapers to a blunt tip like an upside down triangle. Looking up revealed a weathered face of bulges, rising cracks and blocks near the top...comfortable technical climbing. I knew another gully bordered it on the other side...what a surprise that was. Below the blocky wall on approach to the northern gully. First gully and the left side of the "V" Wall. Notice the chunk of stone on the left...cool area! The left-hand gully that we crossed seemed to be more of a fracture while the right-hand side was a clean trap dike rising a couple hundred feet high. It looked amazingly similar to its big brother on Colden. 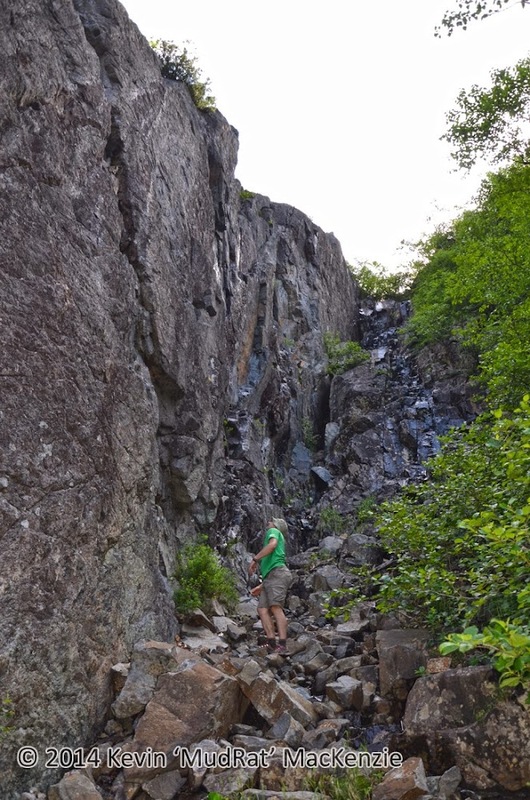 The stone stepped basalt/gabbro with a nice cascade running down various areas. From the dike, the climbing wall rose vertically with several interesting options for use as a first pitch; my original assumption was to begin at the bottom amidst the bulges. The wall would add a harder and more exciting start to the climb. There were three obvious choices; the lowest was a left-rising hand/fist crack weathered on its edges. Slightly higher up was a thin finger-crack and then a blocky chute with larger holds. The higher we started, the shorter our overall route would be, however. Our sights focused on the lowest line along the obvious crack—very aesthetic. The "V" Wall (and basically Pitch 2 of the route)--anorthositic bulges dead center in the photo. Adam studying Pitch 1 of the route...nice trap dike to start in! Adam led placing cams in the crack as I belayed. The crack was eroded on the edges and thus blockier and filled with holds. 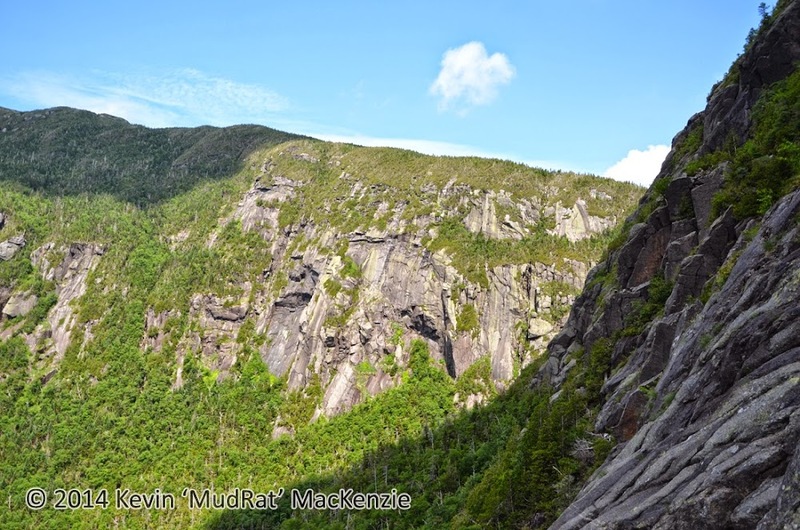 As he climbed, I noted the arena in which we were climbing—the dike fell away into the woods and the vertical wall with Adam high up the crack framed Marcy’s East Face and Grand Central Slide. As usual, I felt humbled by the area and thrilled with our project. I followed and cleaned the pitch; four or five cams over 90 feet. The rock was solid other than a few loose pieces in the crack itself. The edges on the face were copious enough to make the footwork easy. I reached the end of the crack which led into a narrow gently rising gully. Adam belayed from a small platform just below a grass island. We were perhaps 1/4 of the way up the wall. Adam nearing the corner onto the main face. Nice belay point with Marcy's wall behind. The line up the second pitch seemed obvious though nearly anywhere would have worked. Cracks and pitted anorthosite was everywhere. 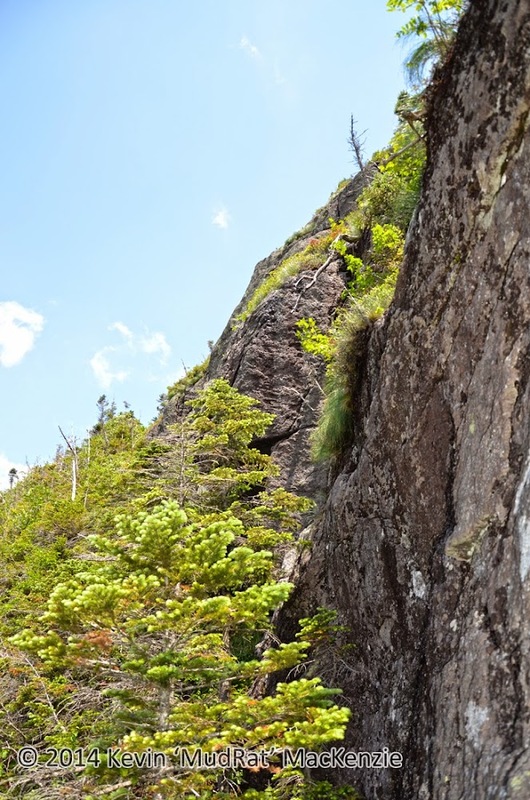 Adam traversed about 30’ across to a right-rising crack and placed gear for about 100 feet along it before stepping over a small corner and heading up another crack that went straight up the top of the face into the bushy runout for the third pitch—a technical slide. On Pitch 2 looking nw...home, sweet home. Last edited by mudrat; 07-15-2014, 06:56 AM. On the slide, he chose a nice line, aiming for the more difficult areas to make it interesting...the same tactic he used below. 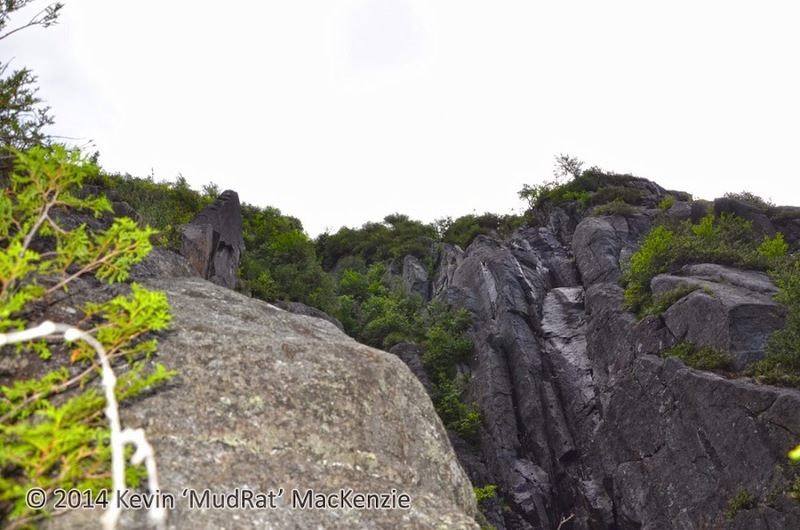 The slide was steep with a crux move about 50’ up from the base. A couple bulges led to a more vertical step with a thin crack placed just out of reach without thinking about it. Beyond, the face decreased in slope and got mossy for a brief stint at the top. The upper segment had a thicker crack and bomber holds leading to the top. 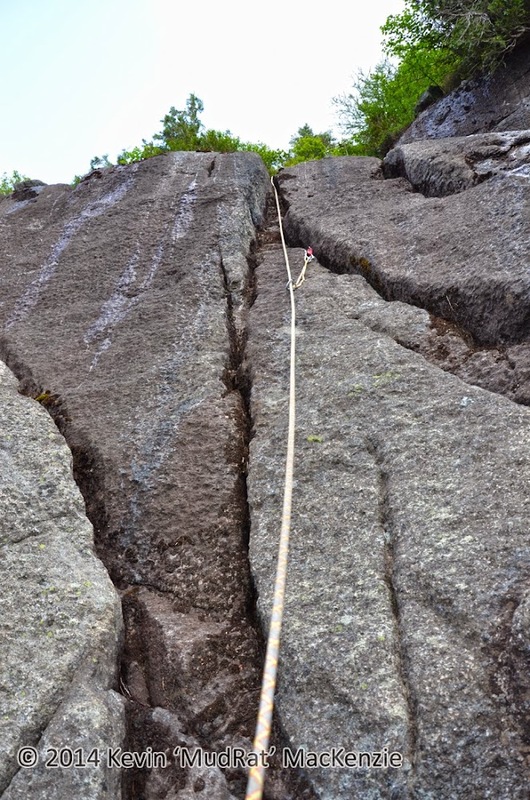 We crossed a wet recessed “V” gully at the top and climbed a 10’ vertical wall where and anchor was set in a horizontal crack. Above was the fourth and final pitch beyond a short bushwhack through tamarack, balsam and cedar. He eyed another rising hand-crack running up to the top of the 40’ wall. Attaining the crack was the crux of the pitch, perhaps the route. I watched as the trees swayed and he tried various options. Though low, this ] move was complicated by a nearly vertical blank section heavily laden with moist moss. Only a shallow crack and few nubs of stoned aided in traction. I realized how difficult it was when I reached the area. 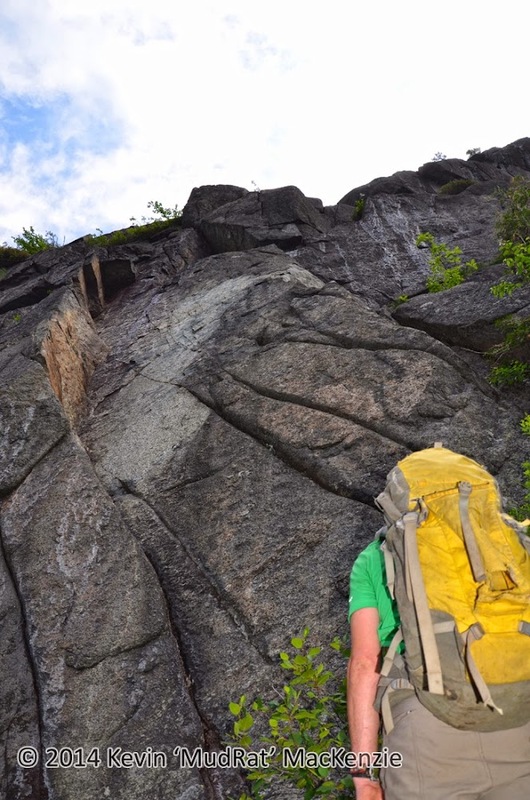 Once in the crack, the climb was straight-forward with two perpendicular cracks making it even easier. Adam at the end of the route, top of P4. A large tamarack made the perfect anchor point at the top and we relaxed in the blueberry bushes surrounded by a sea of krummholz. In all, the route turned out to be 505 feet long over 4 pitches. 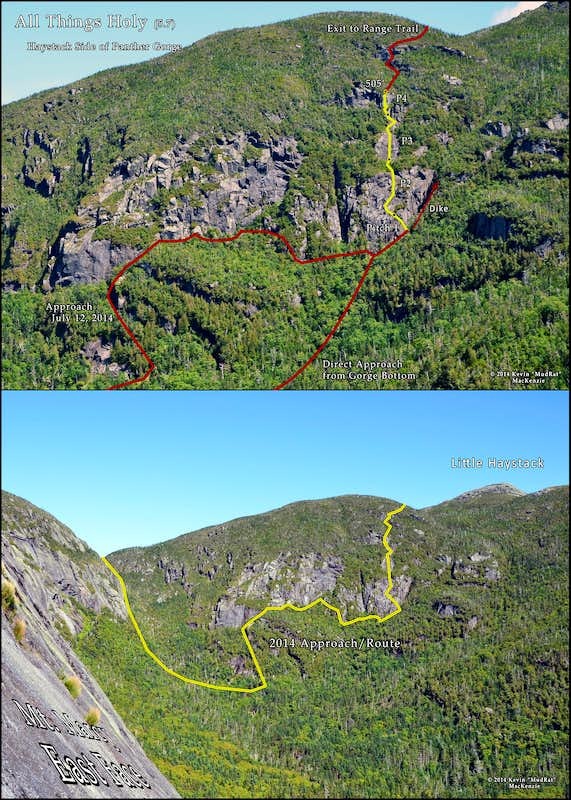 All that remained was a bushwhack up to the Range Trail—about 250 feet of elevation gain over 800 ground feet with some intermittent small cliffs in between. 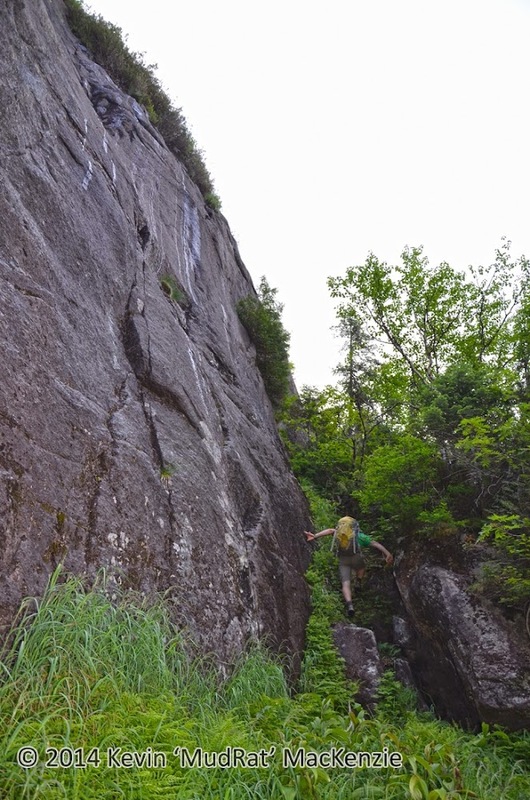 The first cliff, around 50 feet tall was fun; I bailed after the first half since my trail runners don’t perform well while climbing steep rock. Adam continued up and we met at the top of the pitch. 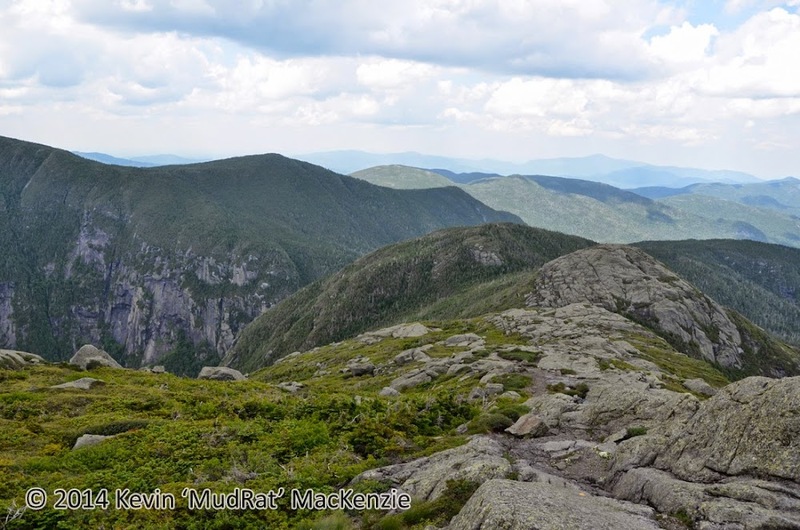 Continuing, we struck a heading of 60 degrees ‘true’ which put us on a course toward the col between the shoulder of Little Haystack and Little Haystack proper. The trees were tight in some areas and loose by my standard in others. We finally reached the Range Trail. I sat briefly huffing and puffing, choking out a quip that Adam respiration rate was barely elevated. A little while later at 3:30 p.m. we were relaxing and eating a late lunch on Mt. Haystack’s summit. Good conversation ranging from area history to the pitch ratings and name of our new route made the time pass quickly. 19 miles from our start, we ended the adventure at 6:30 p.m.—13.5 hours in total. It seemed almost too easy, but it’s nice to have a shorter day than expected for a change! 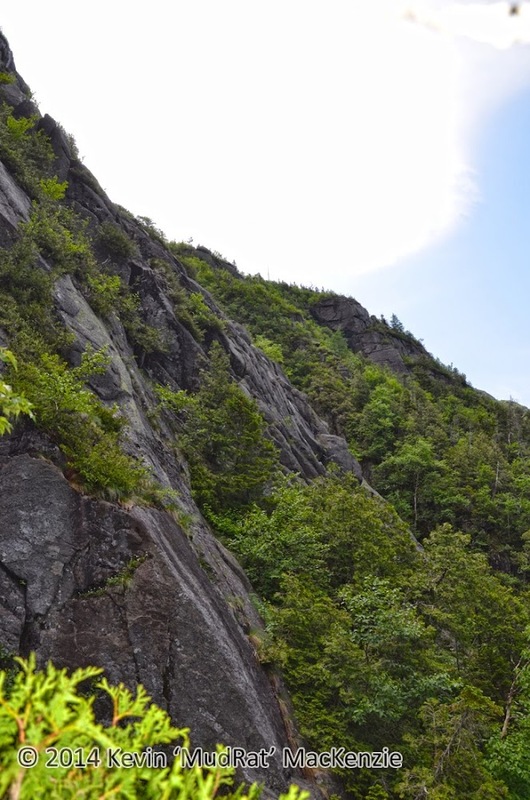 The knob left and back from Little Haystack hosts the route; down to the left about 600 vertical feet. I eagerly read your adventure but you guys denied me the "crux" of the story! What was the inspiration for the new route's name!?! Something about its characteristics, thoughts while climbing it, recent events? Don't leave me hanging here! Congratulations to you both! How sweet to have created a new route! 13.5 hours for the whole trip..... for someone who need a rest........ I think you can do better (just joking). Remember. "MacKenzie Bowl" this may sound odds, but man you deserve it. Impressive area and achievement to say the least. Trailboss: Good pun! Those of you who know me know that I'm not a preachy Christian, but I have strong Christian beliefs. The title's a testament (no pun ) to that foremost. Adam had a really good point too--the rock is highly weathered--holey. NP: I think Adam could have ripped this off in about 9 hours, . Everything went perfectly even with the extra weight of the gear. The only thing I'd do differently to shave off time/effort in the future lies on the approach. Hitting it from the weakness between the lower cliffs below the "V"--a more direct approach rather than traversing the whole wall to the north. We wanted to explore that anyway, so this was perfect for our intent. I need to re-emphasize that the route wouldn't have been what it was w/o Adam leading. You are a man of follow through! Your ambition and perseverance are to be commended. When I am looking at a slide or a route from far away I'm thinking yeah maybe I'll possibly return to climb it someday. What I like about you is that "someday" is usually someday very soon. Awesome climb and report. 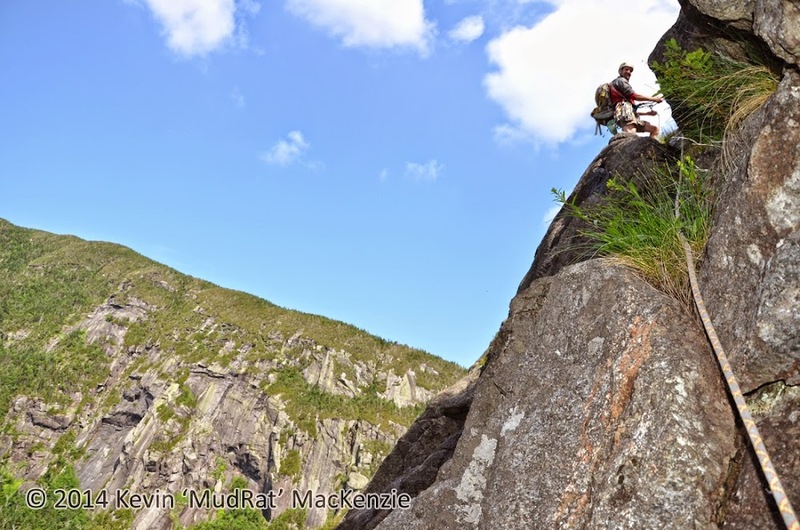 Again your mark on Adk climbing history is in the making of a long to be remembered legend. Are there many decent non-technical routes from PG to the top? Neil: You could follow the route we took up the snaking drainage in the Great DeRanged Traverse. You could also nail the dike to the right of the V Wall, I sent you the high res pic. Go south from the top and follow outcrops to the summit might be fun. Also, the Haycrack report I put up a month ago...there’s a ramp in the woods on the right of the technical portion. It might be fun if not thick above that! 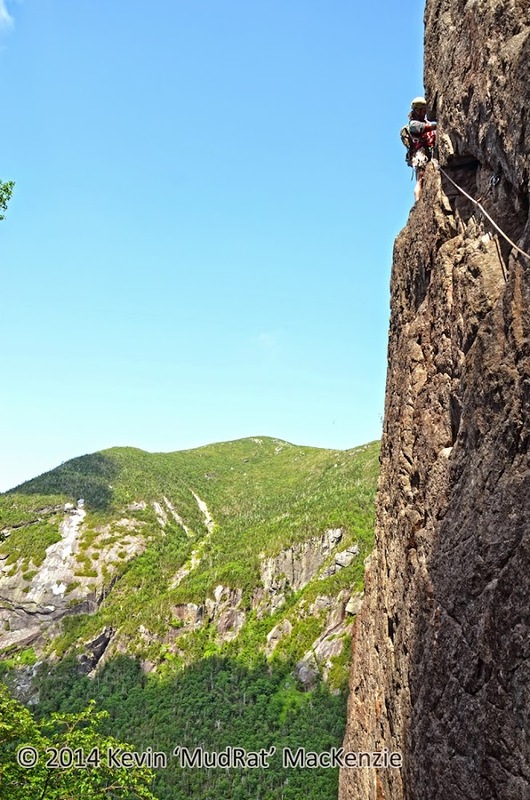 "]Great DeRanged Traverse[/URL]. You could also nail the dike to the right of the V Wall, I sent you the high res pic. Go south from the top and follow outcrops to the summit might be fun. Also, the Haycrack report I put up a month ago...there’s a ramp in the woods on the right of the technical portion. It might be fun if not thick above that! Way to be, keep it rolling. Thanks JZ. This was a fun one. More PG adventure before winter for sure...!